This article first appeared in the Rushville Republican on July 18, 2017. The Rush Memorial Hospital Foundation Board of Directors is pleased to announce the recipients of their annual scholarship. 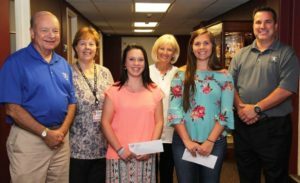 Recently RCHS graduates Kassandra Herbert and Madison Owen were each presented with a check for $500.00 to use for the college expenses. These scholarships are given to two graduating seniors that are furthering their education in the healthcare field. Kassie Herbert will be attending the University of Southern Indiana to major in Nursing. She was instrumental in inspiring our community to donate to the Jake McKee Heart of Gold Fund by donating the proceeds she made at the 4-H fair livestock sale to the fund. Kassie is the daughter of Michelle and Jerry Herbert. Madison Owen is the daughter of Stephanie and Michael Owen. She will be attending Ball State University to major in Speech and Hearing Therapy. Madison, while in school, was very involved in 4-H and sports. The annual scholarships are made possible from the gracious supporters of the RMH Golf Outing. The 2017 RMH Golf Outing will be held July 21 at Antler Pointe Golf Course. “Thank you so much for this opportunity to help me go to school”, shared Kassie Herbert. “Every bit of financial assistance helps me reach my educational goals. Thank you.” stated Madison Owen.